Praised for his “artistic authority,” “fluidity of expression,” and “great delicacy of feeling,” Michael Sakir serves as music director of Opera Memphis. In Opera Memphis’ 2018-19 season, he conducts MADAMA BUTTERFLY, H.M.S. Pinafore, and Jerre Dye and Zachary Redler’s The Falling and the Rising – a new opera based on interviews with wounded American veterans. He also returns to the Opera Company of Middlebury to conduct CENDRILLON and the Janiec Opera Company at the Brevard Music Center for Carlisle Floyd’s SUSANNAH, and DIE FLEDERMAUS. In the 2017-18 season, Sakir conducted L’ITALIANA IN ALGERI and Alessandro Scarlatti’s THE TRIUMPH OF HONOUR with Opera Memphis. 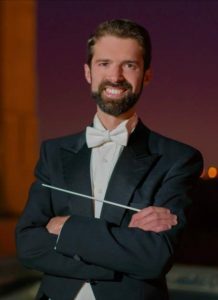 He also returned to Des Moines Metro Opera as conductor for Mark Campbell, Kimberly Reed, and Laura Kaminsky’s AS ONE as well as the Opera Company of Middlebury for Andre Previn’s A STREETCAR NAMED DESIRE. Additionally, Sakir made his debuts with Shreveport Opera conducting THE MAGIC FLUTEand with the Janiec Opera Company at the Brevard Music Center conducting MADAMA BUTTERFLY and CANDIDE. In the 2016-17 season, Sakir made his guest conducting debuts with Intermountain Opera Bozeman in THE DAUGHTER OF THE REGIMENT, Opera Company of Middlebury in IL TRITTICO, and returned to Opera Orlando for DON PASQUALE and Opera Memphis for Jake Heggie’s THREE DECEMBERS. He also made his debut with Washington National Opera as cover conductor for Jake Heggie’s DEAD MAN WALKING. Other recent guest conducting engagements include Eugene Opera in THE TURN OF THE SCREW, Opera Orlando in THE IMPRESARIO and Poulenc’s Les mamelles de Tirésias, Des Moines Metro Opera in Philip Glass’ Galileo Galilei, Northwestern University for DEAD MAN WALKING, American Opera Projects for AS ONE, Opera in the Ozarks for LA CENERENTOLA, and Opera North (NH) for THE TENDER LAND. Sakir holds bachelor degrees in Piano Performance and Music History from the Oberlin Conservatory of Music and a graduate degree in Orchestral Conducting from The Boston Conservatory. He was a participant in the 2017 OPERA America Leadership Intensive. He is a native of Northern California.